SEATTLE – Many African nations have made substantial progress in vaccinating children against life-threatening diseases, however, within countries wide discrepancies remain, according to a new scientific study. The study, funded by the Bill & Melinda Gates Foundation and conducted by the Institute for Health Metrics and Evaluation at the University of Washington, was published in the international medical journal The Lancet. 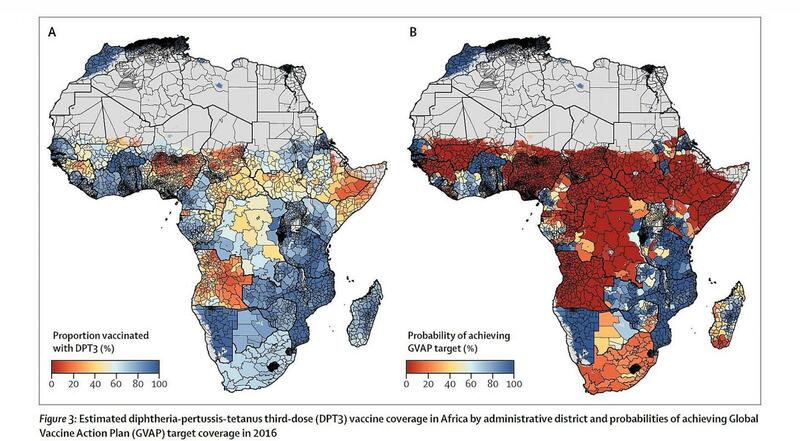 The study, “Mapping diphtheria-pertussis-tetanus vaccine coverage in Africa, 2000-2016: a spatial and temporal modelling study,” maps nations in fine-scale, 5×5 kilometer increments, so that health officials nationally and locally can identify gaps in vaccine coverage and target interventions with precision, tailoring health policy decisions at local levels. Using data from nearly 900,000 children, this analysis provides the first annual estimates of childhood DPT3 coverage across the entire African continent. It measures each community against the Global Vaccine Action Plan benchmark of reaching 90% national coverage and 80% in every district. These goals were established in 2012 by WHO member nations, as well as other organizations, including UNICEF, the Gates Foundation, and Gavi, the Vaccine Alliance, a public-private health partnership committed to increasing access to immunizations in poor countries. Of the 52 countries studied, only Morocco and Rwanda are estimated to have already met the district-level goal of 80% coverage. In contrast, on the local level, areas of DPT3 coverage at or below 25% were found in several countries, including Nigeria, Chad, Ethiopia, Somalia, and Angola. Moreover, dropout rates exceeding 25% were identified in portions of Nigeria, Angola, Chad, Mali, Guinea, Liberia, Equatorial Guinea, Central African Republic, South Africa, Somalia, and Ethiopia. The Local Burden of Disease project at IHME aims to produce estimates of health outcomes and related measures that cover entire continents, but to do so at a very fine, local resolution. Such estimates allow decision-makers to target resources and health interventions precisely, so that health policy decisions can be tailored for local areas rather than entire countries. Combining local detail with broad coverage – producing 5×5 kilometer estimates for entire continents and, eventually, the world – would give health officials everywhere the tools to make locally informed decisions and, in the process, help all people live longer, healthier lives. The Local Burden of Disease project is led by Dr. Simon I. Hay, Professor of Health Metrics Sciences at the University of Washington and Director of Geospatial Science at IHME.